By our calculations, it’s Wednesday. 1) It’s the middle of the week. 2) You just ate some pudding. Wednesdays are pudding days. No exceptions. 3) You can’t play with that zipper thing on Google anymore. It’s gone now. Which stinks. Also, it’s time to mobilize some troops for a little midweek happy houring. Behold GiddyUp, a new iPhone and Android app that lets you organize meetings, events and last-minute quaff sessions en masse by leveraging the contacts that are already in your phone, available now. This is essentially the bigger, stronger, less obnoxious-er version of sending an Evite or starting an email string to make plans. And yep, there are a few of these floating around out there already. But with this one, your friends don’t need to have the app, everything’s done through your contacts list... and it’s called GiddyUp. Which has to count for something. So let’s say you’re setting up a round of single-elimination water park strip cricket. (Or, like... golf.) You’ll pull up the app, select some friends from your automatically uploaded phone book, and enter the time and location. 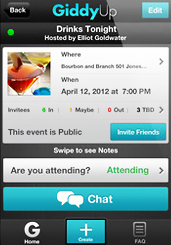 Once you hit send, the invite will pop up like a text on everyone’s phone, complete with a link to your freshly minted event page where you can have a group chat and/or collectively tweak your plans. Collective tweaking is the best.